The Cop Ankle Band  combines economy with the ultimate in concealability. The breathable neoprene cuff has acrylic sheepskin padding behind the holster area and a Velcro closure. 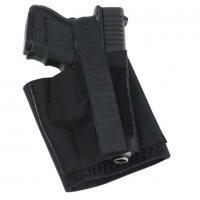 The holster offers an adjustable Velcro retention strap. The Cop Ankle Band fits ankle/boot circumferences up to 13". Fit well over my calf but have to wonder if you had a high top boot if it would be large enough to wrap around. Pistol was held securely in place. I love the holster, it stays in place. But one thing I wish they could make it wider, cause it is pretty on me. Great choice for the money and the Kahr CW40 model fits multiple guns. It will get a lot of use. Great customer service and feedback from CopsPlus. Will this holster accept the LC9 with the trigger guard laser max? This will NOT fit the Ruger LC9 with LaserMax Laserguard.